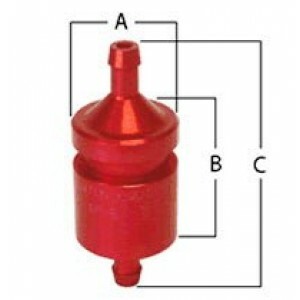 In-line tank pressure relief vent valve. -Middle Body Length B 1.57"
The TPV8 In-Line valve is acceptable for use in general automotive, including fuel injected, applications. The new TPV8 in-line valves are built to prevent standing gas losses when the vehicle is stopped. The in-line valve will open when fuel is being drawn from the tank. It will then shut once the flow of fuel stops. If there is a pressure build-up in the tank - such as a hot car with a full tank of fuel exposed to strong sunlight - the valve will open to release the excess pressure. It will then close once the excess pressure is released. The TPV8 valve can be mounted at any angle.